If you've read the other entry you will already know that Islay's golf course is The Machrie, Ben Wallace of The Scotsman visited it recently and wrote a review of The Machrie Hotel and Golf Links. He was very happy with the hotel and the golf course, although not so much with the weather he had and his resulting score. 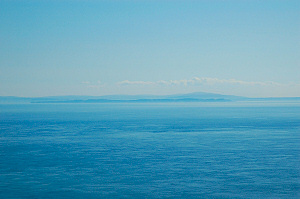 They say on a clear day you can see Scotland and the Isle of Islay. The miserable weather robbed us of the coastal holes where we would have had - on a clear day - the best views. As I've never been to Northern Ireland I can't show you the view to Islay from Ireland, but the view is from The Oa and Beinn Mhór on Islay over to Ireland taken on a clear and sunny day during the Islay Walking Week April 2006. That's all, simple as that.